Back by popular demand, Argentine Chefs Daniel Pistone (Black Barn Bistro) and Dante Moren come together to put on 2019's first of two Open fire (Asado) Sunday lunches. The entire feast will be cooked outside over open wood fire which will start with shared canapes followed by locally sourced Vegetables, Fish, Lamb, Beef & Wild Game then dessert. Everything will be served family style spread over several big long tables. There will be a complimentary drink upon entry followed by a cash bar. Argentine Chef Dante Moren cooked professionally in Argentina and Uruguay specialising in outdoor open fire cooking for 13 years. This included a 3 year stint at the high end hunting lodge ‘Hayes and Hayes outfitters’ in Central Argentina. He then decided to move to New Zealand and bring his passion of traditional open fire outdoor cooking called ‘Asado’. Dante then developed a strong connection with the New Zealand wilderness and began going on hunting expeditions with local hunters. Dante started adapting and developing his technique to suit New Zealand’s wild animals, firewood and climate. One of his recent projects was cooking for 1500 festival goers at New Zealand’s regional Burning Man event, ‘Kiwiburn’ in Hunterville. Chef Daniel Pistone, also Argentinian Born, is the Head Chef here at Black Barn Bistro. He cooked professionally in fine dining kitchens for 10 years before making the move to Hawke’s Bay in 2008. Daniel grew up in a farming town of Tandil in the east of Argentina. Growing up, his father was in charge of the cooking, who had a strong passion for traditional Argentinian BBQ. Daniel’s food memories from his childhood include whole suckling pigs “al Asador” and Beef Short ribs “costillar” at home or at friends ‘Quinchos’ (a separate room from the main house that had an open fire bbq quite common in Argentina). Daniel and his father would grill over wood fire every weekend and the family would then gather and eat together. It was these moments that inspired Daniel to pursue a career in cooking. 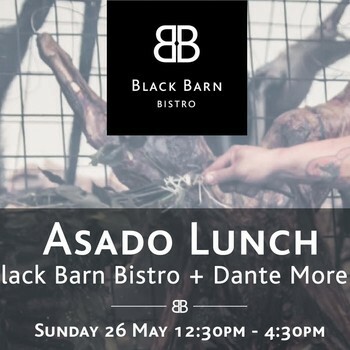 Black Barn Bistro x Dante Moren Asado Lunch Back by popular demand, Argentine Chefs Daniel Pistone (Black Barn Bistro) and Dante Moren come together to put on 2019's first of two Open fire (Asado) Sunday lunches. The entire feast will be cooked outside over open wood fire which will start with shared canapes followed by locally sourced Vegetables, Fish, Lamb, Beef & Wild Game then dessert. Everything will be served family style spread over several big long tables. There will be a complimentary drink upon entry followed by a cash bar.